Maintaining an eating schedule during the day is well known in the fitness industry, but lately the debate has shifted from daily to nightly consumption – namely, what to eat before bed. If you think about it using everyday common knowledge, you will most likely come to the conclusion that you need to eat some complex carbohydrates and some protein. Nonetheless, this can vary and we should look at the effects of food eaten before bed as well as what kind of food you actually need. Every macronutrient has a different effect and it goes even wider than that – you need to make sure your macronutrients come from the appropriate places. When you eat right before going to bed, you are doing something just as important as eating during the day. Most people will tell you that you need to eat as little as fifteen minutes or as much as two hours before going to sleep, but that you should pick out the right timing according to your needs and wants. Also, the myth that eating before bed is unhealthy is just that – a myth. You need to eat adequately before going to sleep just like any other time of the day. If you don’t eat enough, you might wake up in the middle of the night, starving. This means that you’re going to be shoveling everything down your throat and this is generally a bad outcome for everything and everyone. Now that you know how important the pre-bed meal is, you need to know what to eat. What I would suggest is something that will digest slowly, such as casein protein, healthy fats or even fibrous carbohydrates. In everyday terms, this means eat some cottage cheese, vegetables or natural peanut butter. Complex carbohydrates are also okay but you really need to be careful not to overeat and ruin your entire plan. Also, keep away from any foods filled with unhealthy fat and sugar, which you shouldn’t be consuming anyway if you watch your figure at all. Also, stay away from anything that has caffeine in it, such as coffee or green tea. Caffeine keeps you awake and you need to get a full night of sleep without the substance getting in your way. I bet you’ve heard that rumor that eating before bed will make you fat, but there really isn’t any substantial and empirical scientific data that backs up this claim. Instead, the most important part of managing your last meal of the day is keeping the amount of food in the low to medium scale. 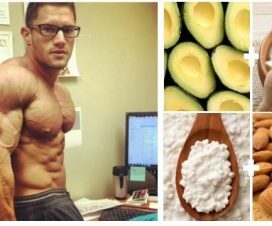 Don’t eat the wrong things – there are plenty of forums, books and a plethora of internet materials to help with your quest for a better body, all you need to do is go out there and explore until you find exactly what you need. After that, just stick to it and whatever happens, don’t give up. Giving up is the single worst thing you can do, right after binge-eating because you woke up.